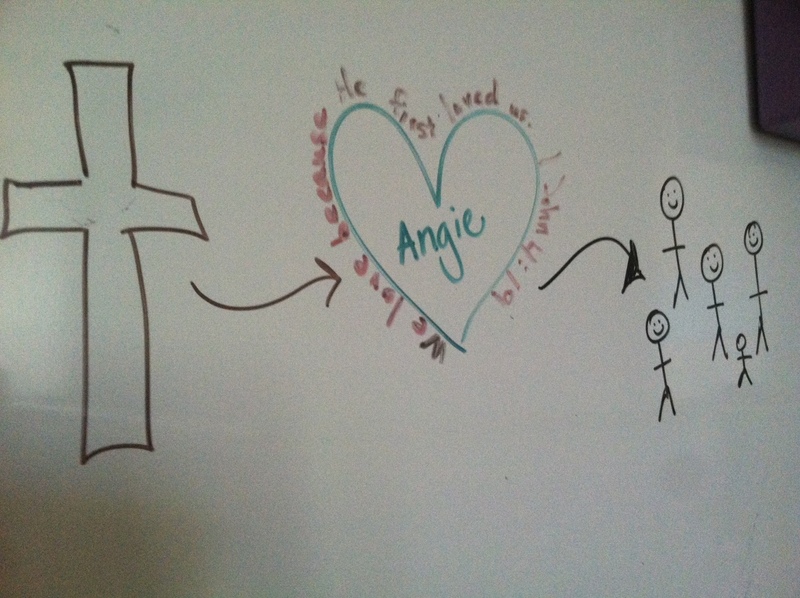 Last week our verse was, “We love because He first loved us.” 1 John 4:19. I had the girls draw a heart in their prayer journals. In the middle of their heart they wrote their name. Around the edge of the heart, they wrote the verse. Then we talked about what it means. So we drew a cross to the left of the heart with an arrow pointing to the heart. Because God loved us, the arrow points from the cross to our hearts. The love of God enters our hearts by way of the cross. Then we drew some stick people to the right of the heart. Again, we put an arrow in between the two to show that love flows from our heart to others. When you trace back the path of the arrows, it all starts with Jesus and the cross. Here is our plan: When someone is yelling (usually in our house it’s “STOP!”), whether it be to stop kicking, singing, smacking, or generally stop being frustrating, the new rule is to hold up a hand to the face to accompany the “STOP!” In our family, the “STOP” seems to be second nature and takes no training, so I decided to use that to my advantage. Usually our yelling is self-seeking and is accompanied by name-calling. Having the hand up reminds us all that we need to stop. It doesn’t matter if we are the one doing the yelling or the name-calling, or the annoying, we all need to stop. We need to think about our heart drawings in the prayer journals. When a hand goes up, everyone should stop and say the verse together. “We love because He first loved us.” Then we have to pause and ask the questions: “How did Jesus love me?” ( He sacrificed for me.) “And how can I sacrifice for the other person right now?” Our frustration and yelling and difficulty in loving each other usually arises when we are thinking more about what we want to get out of the relationship or situation than what we can give up for the other. So, in an effort to retrain our first response in those situations, let’s ask ourselves not what I can get, but what can I give, remembering all the while that it is only because of Jesus that we have the capacity to love sacrificially. GULP…it worked. Without further thought, I ran upstairs and started typing. I probably should have followed up with them more, but I was so encouraged and shocked that I didn’t think about that until now. Honestly, in retrospect, I don’t even know if the money was the issue at the center of all the yelling. I probably should have at least checked that much, but needless to say, as of yet, there still has been only happy play noises down there, so I don’t dare dig up old bones. This moment is going on the “Count Your Blessings” board. Hopefully, having a practical way to apply the gospel to those intense situations will stick. My hope is that they will eventually start leading the way themselves by putting up a hand without me even being there. Who knew a “hand to the face” could be such a gesture of sacrificial love?